Appearance: Foxes look like bipedal foxes from our world with clothes. Vixens, who are almost always seers, often wear mystical clothing with bones and the like. They tend to be slim and wiry, or otherwise fairly thin, with slitted eyes that are most often green, gold, or occasionally brown. The closest thing a fox gets to beautiful is an evil sort of attractiveness. A fox's face is often finely shaped, with a narrow snout. Life Span: Foxes seem to have a longer lifespan than some of the smaller creatures like rats. Diet: Foxes eat just about anything. Typical Personality: Most foxes, true to species, are crafty and sly and intelligent. Many have leadership positions in vermin hordes, though they make excellent thieves, spies, or traitors. Vixens are often seers, mystics who travel close to a horde leader and advise him on various matters. They are very versatile and have any accent or none. Most seem to prefer brains to brawn. Appearance: Foxes look like small dogs with narrower noses, reddish-orange fur, and thick, 40cm brush-tails. Males are about 67-72cm long and weigh 6-7kg, while females are 62-67cm long on average and weigh around 5-6kg. Life Span: Most foxes live to be only one or two years old in the wild, though some have lived up to 9 years old. Diet: Foxes eat crabs and dead seabirds when they live in salt marshes; small mammals such as voles and rabbits in lowland rural areas; as well as earthworms, beetles, fruit (particularly blackberries) and small birds. Foxes eat around .5 - 1 kg of food a day. 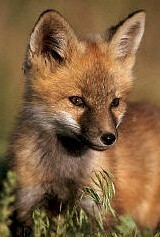 Habitat: Foxes can be found in sand dunes, marshes, mountains, and urban areas. They're very adaptable and can live just about anywhere. Foxes live in family groups of a dog fox and a vixen and their cubs, though sometimes there can be many mated pairs in a single family group. Foxes live in dens, called earths, which may be dug by the foxes or may be burrows dug by some other creature. Typical Personality: Foxes are known to be playful, and are expert hunters. They are semi-territorial but not too much so. 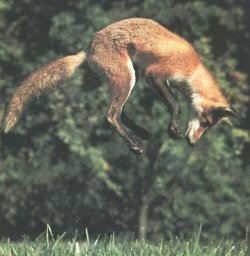 Habits: When hunting mice, foxes will creep up on the mice and then leap very high into the air onto their prey by pinning them with their forelegs. The fox then hops down on the mouse and pins it. Foxes are mostly nocturnal but come out in the daytime on occasion. Life Cycle: Usually only one vixen in a family group has cubs, and only once a year, usually in the spring. Each litter has four or five cubs who begin to venture out of the earth when they are four weeks old and are fully weaned after 8 to 10 weeks, but remain with the vixen until the autumn after their birth.